Vintage cars took to Mid-Ohio Sports Car Course June 21-24 for the Vintage Grand Prix. This patriotic car was one of many running at Mid-Ohio during the Vintage Grand Prix. 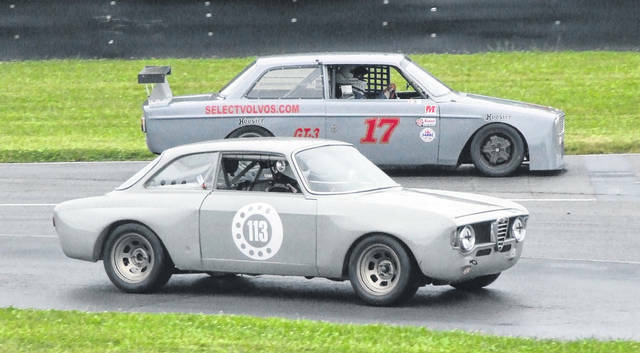 When Mid-Ohio Sports Car Course hosted its annual Vintage Grand Prix from June 21-24, despite rainy weather over the weekend, many races were held in multiple groups. There also were a pair of endurance races, the Mazda Miata Heritage Cup, Volvo Cup and International GT events taking place. In the Vintage/Classic Enduro, which took place Sunday morning, the duo of Jerry Robinson and Bobby Archer finished in first place, while the team of Frank Marcum and Jeff Rocco was second and Gary Schultz and Mark Bennett teamed for third. The Historic GT/GTP endurance race, also held Sunday, was won by Tom Pank, while Steven Hill was second and the duo of Mark Sandridge and Joe Varde finished third. While the Vintage/Classic Enduro was 60 minutes and the Historical GT/GTP Enduro lasted 90, the weekend’s other races were slotted into 20-minute intervals, although the weather did shorten their durations, particularly on Saturdfay. Sunday’s Volvo race was won by Frank Marcum, with Gary Jebsen coming in second and Jim Perry taking third. Saturday’s Mazda Miata event was won by Mark Cefalo, with Brian Murdick running second and Jonathan Davis taking third. On Sunday, those same three drivers placed in the same order to reach the podium again. Both International GT races were held Saturday, with Tom Pank winning the first one, Steven Hill running second and the duo of Mark Sandridge and Joe Varde getting third. Pank won again in the second race, while Steven Hill and Josh Hurley took second and Edward Baus ran third. On both Saturday and Sunday, there were seven group races. For Groups 1, 3 and 4, Jonathan Gaynor won on Saturday, while Bill Schwacke took second and Randy Williams placed third. Williams moved up to first on Sunday, with Schwacke finished second and David Zavetsky placed third. Group 2’s first race was claimed by Todd Strong. Bob Hatle finished second and Dan Cowdrey finished third. Joe Blacker took the checkered flag Sunday, while Hatle was second and Strong came in third. On Saturday, in Groups 5 and 7, John Thompson came in first place, while Rob Sherwood picked up second and Avery Stuckart placed third. On Sunday, Sherwood was the winner, Thompson placed second and Stuckart finished third for the second straight day. For Groups 6 and 12a, Eric Lux claimed first place Saturday, while Scott Holley ran second and Michael Origer took third. On Sunday, Origer was the winner, Lux ran second and Scott Graham placed third. In Saturday’s Group 8 and 12b race, Mark Congleton finished in first place. Jeff Mitchell ran second and Donald Wannagat placed third. Gary Schultz took the checkered flag Sunday, while Maor Primo was second and Robert Mocas claimed third. In Groups 9 and 11, David Nikolas won on Saturday, while Jim Johnston placed second and Jacek Mucha took third. Nikolas won again on Sunday, with Robert Gewirtz placing second and Mucha claiming third place again. Group 10’s Saturday race was won by Eric Lux, while Casey Putsch finished second and Jose Cortes ran third. Lux also won on Sunday, with Putsch finishing second again and Barry Fromberg claiming third.